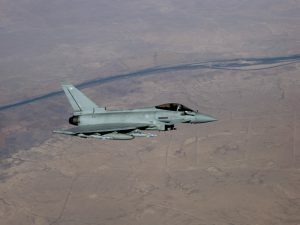 According to AirWars.org, the U.S. and U.K. launched 18 strikes in Syria and nine strikes in Iraq over the weekend, bringing their bombing over the last 975 days to nearly 20,000 strikes. Jafari is with Al-Mayadeen, a Beirut-based pan-Arab news channel founded by Ghassan bin Jiddo who gained much acclaim for his coverage of the Israeli-Hezbollah war of 2006 and was host of “Open Dialogue” on Al-Jazeera. Jiddo resigned from Al-Jazeera in 2011, accusing it of betraying its journalistic mission as the Arab uprisings began. Jafari stated that the U.S. cruise missile attack was in part a way of gaining leverage for Secretary of State Rex Tillerson ahead of his trip to Moscow, scheduled for Wednesday. This was similar to the analysis of Larry Wilkerson, former chief of staff for Colin Powell. Wilkerson also told The Real News that the attack was similar to the Gulf of Tonkin incident or U.S. government fabrications regarding Iraqi WMDs — a pretext. Wilkerson also states that his sources — including members of the U.S team that monitors global chemical weapons — believe that the alleged gas attack was in fact possibly the result of the Syrian Air Force striking a storage depot — and that they had told the U.S. and Russia that they would strike it. Erlich is a Peabody award-winning foreign correspondent. The paperback edition of his 2014 book Inside Syria: The Backstory of Their Civil War and What the World Can Expect has been updated with a new epilogue and includes a foreword by Noam Chomsky. Erlich said today: “While seemingly dealing a decisive blow against Bashar al-Assad’s use of poison gas, in reality, the attack seriously escalates the war and could spark more military clashes in the region. “Destroying one Syrian airbase will not stop attacks on civilians by Assad and Russia. The U.S. currently has over 1,000 troops stationed in Syria, and Trump will have to escalate those numbers and their combat roles in order to fight Assad. Russia has already announced that it will cease exchanging intelligence and air coordinates with the U.S. Trump’s actions increase the possibility of a military clash with Russia, endangering the lives of U.S. soldiers and countless civilians. “In addition, the aggressive attack may embolden Israel to attack Hezbollah, the Lebanese political party and militia. Israel believes Hezbollah is weakened as a result of overextending itself in Syria, and that this may be a good time to launch an attack on Lebanon with U.S. blessings.